Dormant perennial asparagus roots must be planted before any new growth emerges. Purchase 1-year-old roots, even though they may be a little pricier than 2-year-olds. The older ones are larger and may have sustained damage when they were dug up by the growers. They’re also more likely to break or suffer other injury during planting. Asparagus plants started this spring will grow quickly and have leaves by summer. Expect to lightly harvest a few spears in the spring of the second year after planting, with a good crop the following year. Select a well-draining spot where your asparagus will receive at least 8 hours of sunlight daily. Prepare the site well for a 15- to 20-year career of delivering asparagus spears to your table. Cultivate the soil to a depth of at least 12 inches. Apply a complete 5-10-5 or 5-10-10 fertilizer and work it in well to about 4 to 6 inches deep. Follow the packaging instructions carefully. Amend with well-aged manure or compost. A pH level between 6.0 and 7.5 is sufficient. Inspect your perennial asparagus roots for viability. They shouldn’t have any mold or mildew on them, nor should any be evident on their packaging. Bare-root asparagus should smell earthy, but not foul or rotten. No damage or breakage should be present. Roots should feel substantial and heavy. If they feel dry and light for their size, they’re probably not good and should be discarded. Soak the asparagus roots in warm water for 10 to 20 minutes just prior to planting. Cut off damaged or dead roots, but don’t cut off any healthy tissue. Dig an 8-inch deep trench about 10 to 12 inches wide, which should be roomy enough to spread the asparagus roots out comfortably. Multiple rows should be 4 feet apart. Set roots into the trench with their buds facing upward, spaced about 18 inches apart. Cover them with 2 inches of soil. Mulch with 3 to 6 inches of well-aged manure or compost. Water thoroughly and slowly once every 1 to 2 weeks. Soil should be evenly moist but not soggy or wet. 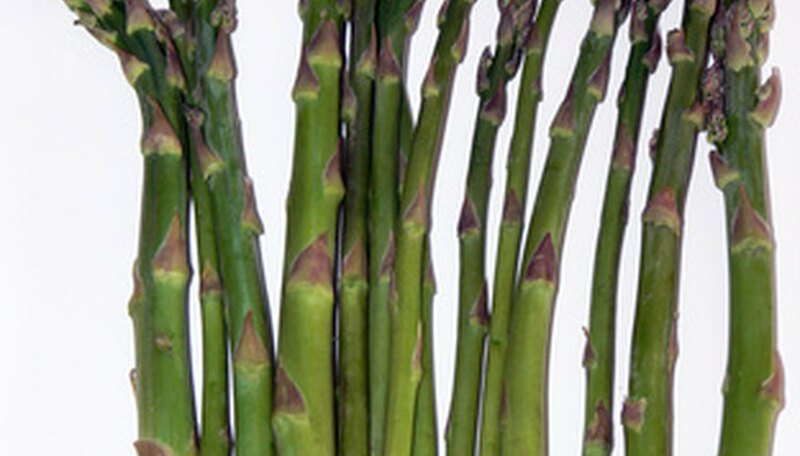 New asparagus plantings typically require 1 inch of water weekly until the first of September. Add more soil to the trench as your asparagus plants begin to grow, beginning about a month after planting. Keep the crown covered and the foliage above the soil. The trench should be about even with or slightly higher than ground level by fall, when you can stop adding soil.